As the ocean closed oceanic layers were pushed above the Arabian plate. The huge pressure involved in this process changed the rocks appearance and order. Layers were folded, broken and also turned around: former lower layers are now on top, top-layers are now at the bottom. Where they broke, mineral fluids entered the empty spaces and crystallized. In this area they can be seen as white veins of Magnesite. The Ophiolites contain many different minerals. Here the rock structure can help us identify one very specific type. 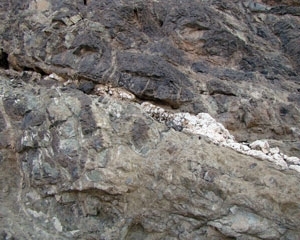 The small holes in the surrounding rock are called “Pigeon holes”. In ophiolite landscapes these holes occur only in Dunite. They are formed as a result of weathering and decay of iron and magnesium rich rock.